Where are we? What do we do? Who are we? Heart Of Texas: This is an area define as being, the City of Waco and the surrounding area, located in McLennan County. DX: A term used all over the world of amateur radio to discribe a radio contact with another amateur radio station outside its own country. Society: A particular section of a community that is distinguished by particular qualities; an organized group of people who share an interest, aim, or profession. The club's name was chosen to precisely locate ourselves as being totally separate from any other point on the map. It is our desire to focus on individuals living in or near the Waco area so as to make it easier for them to participate in club activities and to get to know each member on a more personal level. 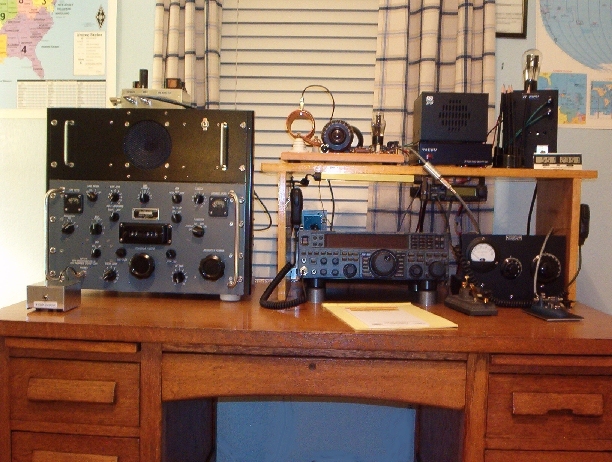 The Heart Of Texas DX Society (HOTDXS) is being founded by a small group of DXers and other amateur radio enthusiasts in the Waco, Texas area to further DXing, contesting, as well as the individual interests of its members. The group seeks to attract members from throughout the surrounding area. Besides on-the-air activities, HOTDXS will hold regular meetings to provide opportunities to discuss DXing and other related topics, and to establish a forum for subjects of common interest or concern. Club meetings are at 9:00 AM on a second Saturday of every month at the Denny's Restaurant located at 2409 S New Road and nearby Interstate 35 South. HOTDXS moreover promotes amateur radio through newsletters and group activities. These include an SSB net every Tuesday at 8:00 PM local time on 28.437 MHz, occasional Special Event Operations to commemorate the anniversaries of local historical events, and the sponsoring of local awards and certificates to encourage participation in some of the more popular HF contests. A first goal was to become an ARRL affiliated club and have 100% of the club members join the ARRL, as well as to have the Heart Of Texas DX Society and its members to earn the DXCC Award. Heart Of Texas DX Society welcomes all licensed amateur radio operators and other interested persons to apply for membership. No annual dues at this time, it's free, you need only show an interest in DXing and playing a role in club activities. All these entities are yours to enjoy. Contact as many as you can. Do so in Peace. QSLs from new DX that are not confirmed on LoTW. Keys owned and used by members of HOTDXS. The W5DXS DXing Odyssey Begins. W5 Bureau Status Quick Search - See what you have on file. Use the Browser's Back or Go to return here.